Bayan Audio SoundBook review | What Hi-Fi? With smart looks, a compact build and clear sound, the Bayan Audio SoundBook is a neat little Bluetooth speaker. This speaker supports the higher-quality aptX Bluetooth codec, and delivers a clear and fairly precise sound. Stream it a WAV file of Birdy’s Shelter and the piano notes sound delicate and sweet. The breathy vocals are direct and intimate, and there’s a sparkle to the treble that gives the SoundBook bite and attack. There’s a good amount of detail; a dash more subtlety and refinement wouldn’t go amiss, though. There’s a bias toward the top and mid frequencies – which are delivered pretty well – but there’s not much deep bass to give weight to the sound. Led Zeppelin’s Heartbreaker has an agile rhythm, but we’d like a meatier, punchier sound. Next to speakers such as the Ultimate Ears Boom and Bose SoundLink Mini, the Bayan’s lightweight sound sticks out. Still, there are no harsh or brittle edges to the treble at normal volume – so it is a pleasant listen overall. We’d be wary of turning the volume up too high, though. It adds solidity, but also further highlights that thinness. The SoundBook, which has a 10-hour battery life, does go loud – but it isn’t a very big or authoritative presentation. The FM tuner is a welcome component. You can search stations manually or press the tune up/down buttons to let the SoundBook find the right frequencies. Music sounds as thin as it does via Bluetooth, but it’s also a little rougher and noisier. Voices, on the other hand, come across as solid and robust, so talk programmes and sports commentaries sound fine. There’s also a built-in mic for hands-free calls. The SoundBook is reasonably useful as a speakerphone, but we’d stick to using a smartphone for better sound quality. The Bayan recovers some points thanks to its smart-looking and well-built form. The nylon cover is robust, and it doubles up as a stand. Simply snap it shut to turn the speaker off – it’s a clever touch. The aluminium panels add a touch of class, and the top-mounted control buttons are responsive and nicely finished. The whole thing is small and light enough to be easily portable too. Our review sample, with its silver finish and turquoise accents, looks at home on a desk next to a laptop. There’s also a black-and-orange version for those wanting an edgier look. There’s a 3.5mm input at the back for connection to music players, while you can plug headphones into the green line output. Both connections retain the SoundBook’s sonic character, but we’d be sure use a good pair of headphones, such as the AKG K451s (£50). We like how easy to use the Bayan Audio SoundBook is. 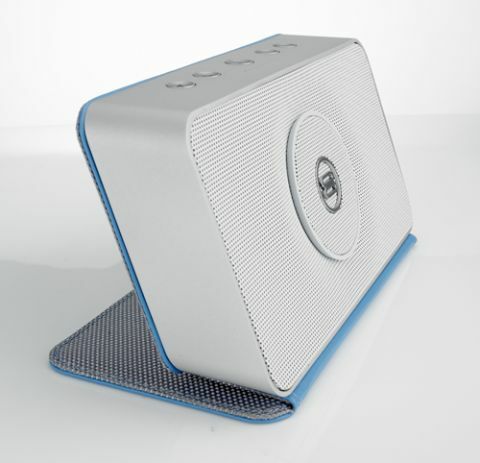 It has some clever design touches that make it an attractive product, and the FM tuner is a bonus. It doesn’t deliver the most balanced sound, and the lack of punchy bass may not suit everyone but, despite all that, it is a pleasant and decent enough listen. We’d be happy to perch it on our desk.